Every day is Earth Day at Eco Promotional Products. 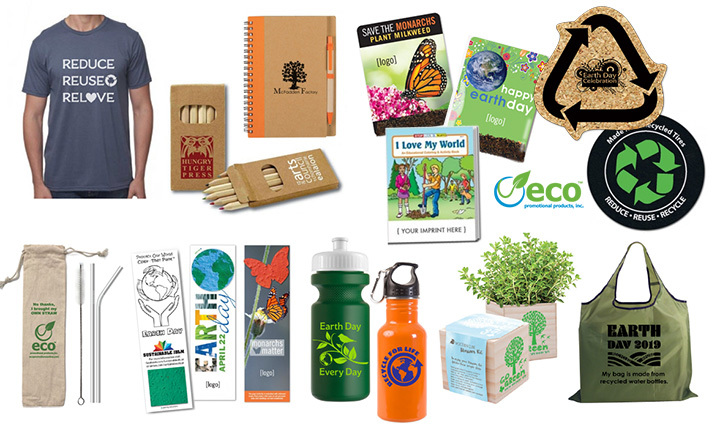 If you are planning an Earth Day celebration, Eco Promotional Products has a broad selection of unique eco-friendly promotional items. The selection is meant to educate and encourage Earth-friendly actions like conserving energy, beautifying green spaces, reducing waste and recycling. Walk the walk and choose Earth Day giveaways that won’t end up in a landfill. Many Earth Day events are geared towards students who will be the caretakers of our Earth in years to come. Educating young people about Earth Day and what it represents is the most important message of the day. In addition to schools, nature conservancies, forest preserves, park districts and other green-minded groups will host events for all ages. Businesses that make sustainability a priority often have Earth Day team-building activities for employees, like beach and park cleanups. Promotional Planting kits: Personalized grow kits have everything needed to grow flowers, vegetables and herbs at home. These items can be started indoors in April and then moved outside as the weather gets warmer. Save Bees & Save Monarchs Seed Packets: Help save the bees with pollinator friendly wildflower seed packets and monarchs with milkweed seed packets. Wildflowers will not only help beautify landscapes, they are also a key food source for bees. Planting wildflowers will allow bees to better pollinate fruits and vegetables and increase crop production. Monarchs lay their eggs on milkweed and these are the only plants their caterpillars can eat. Milkweed plants are vital to monarchs’ survival. These seed packets will bring awareness to the plight of bees and monarchs. Seeded Gift Items: Bookmarks with plantable seed paper shapes, plantable seed paper coins and plantable are two gifts in one. Plant the seed paper and keep the bookmark or pouch for other uses. Reusable Utensil & Straw Sets: These sets encourage waste reduction, a key message for Earth Day. As more and more cities place bans on single use plastic straws, reusable stainless steel straw sets are extremely popular as our reusable utensil sets. Earth Day Activity Books: USA Made activity books will teach young children about recycling, water conservation, saving energy and, in general taking care of the Earth. Reusable Water Bottles: Disposable plastic water bottles are incredibly harmful to the Earth. Sadly, a great percentage of plastic water bottles never get recycled. Giving out water bottles at an Earth Day event encourages people to reduce and reuse. Reusable Shopping Bags: Just like disposable water bottles, disposable plastic bags are equally harmful to the Earth. Reusable shopping bags is the promotional product that never goes out of style. Put your Earth Day message on a foldaway bag made from recycled water bottles. Eco-friendly Office & School Supplies: Choose from recycled notebook and pen sets, recycled colored pencil sets and recycled pens with Earth Day themed shape like a water drop, wind turbine or butterfly. Cork Coasters & Recycled Tire Jar Openers: Coasters made from reclaimed cork and jar openers made from recycled tires come in many Earth Day themed shapes such as a recycling bin, recycle symbol, water drop and more. These products are long-lasting and inexpensive. Eco T-Shirts: Volunteers at Earth Day events need eco-friendly t-shirts. Everyone will love wearing our USA made 100% organic cotton t-shirts which will be worn with pride over and over again after Earth Day. Earth Day is the busiest time of year at Eco Promotional Products. We recommend planning ahead to make sure you get the items you want in plenty of time for your Earth Day event. To see all of Eco Promotional Products’ Earth Day specials, click here.